A sapient tester in every human being ! Oh wait, what is Augmented Reality? Hey, I know a lot about Augmented reality and it is of course so exciting. Why the hell do you think it may not be exciting? I hope you are comparing with virtual reality and calling it to be not so exciting? am I right? Nah..whatever, this is supposed to be a testing Blogosphere where only testing articles is shared, isn't? but now this title sounds so irrelevant to the testing community. Here you go, Augmented Reality (AR) lives in the mixed reality spectrum. AR lives between the real world and the virtual world. Just because, AR brings the elements of the virtual world into our real world how can it be made exciting? If it is exciting then it would have attained the global market place in large numbers, isn't? Augmented Reality was discovered to enhance the visual effect of real world objects. What did it do after enhancing the visual? put it back into the real world. Ah...how can one do it? Yes, through AR technology this is possible. One such example could be, using AR technology we can create human body parts and make use of it for science graduates to visualize and understand more in details. Real sounds can be incorporated to the graphic visual by profound sound engineers. These were made to appear close to reality. But Is that real? Nope! AR world sustained so far with Markerbased, Markerless, Projection and Superimposition technologies. There are many apps in the Appstore and Playstore developed using these technologies. Most of them call themselves to be successful comparing to other AR products. What makes your customer delight? All product success stories revolves around this brilliant question. Let's me put forth this question to all AR product owners out there in the market? Is your customer happy? AR is a very powerful word. It has not evolved completely. We all live in AR evolution. There could be more avenues in years to come. At the same time, many organizations have had made tremendous efforts to build lots of interesting avenues using AR. To name a few, Pokemon Go by Ninatic Inc. Harry Potter Wizards Unite is way more complex game than Pokemon. TaDa Time - 3D AR Messenger app by Augray Inc etc. Money and time is invested to gain this momentum in Research and Development arena. While the development of new AR products in full swing we are parallely creating new areana of testing scope as well. There is a huge demand for AR automation. This is the right time of the year to get us equipped with AR testing skills. AR apps are mostly camera sensitive, geo-location based apps which could potentially work with beacon devices. We all know it is so difficult to test on varied android and iOS devices. Though there are many cloud testing tools which could help us leverage testing better. But still automating remote camera, recording and saving the recorded AR file in remote device and validating it, is still a challenge. Yes, this calls for new testing openings. New challenges in development and test automation pave way for new testing openings. Let us all enhance our skill set in this AR arena and grab more opportunities during upcoming years to come. PS: This image in this article represents an apparel advertisement in newspaper. If scanned using mobile phone can experience the actual product in 3D. 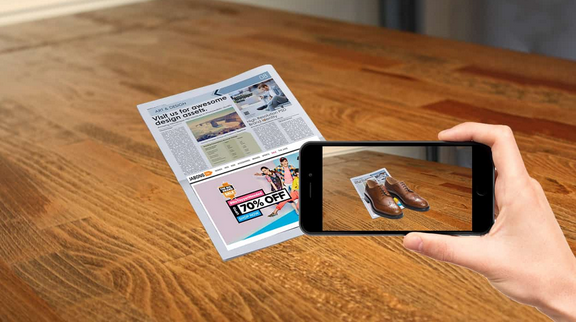 I have used that image to represent augmented reality. The image is copyrighted to www.yeppar.com. With due respect I'm signing off right now. Please do write your comments and feedback to discuss more on this topic. Thank you! Hey All, It's yet another time of a year to exhibit your fullest potential and capabilities to the testing world. Happy New Year folks. Apparently, my last testing challenge was on March 7th 2011. It doesn't mean that I din't accept any other testing challenges. :) What it means is it may not be a noticeable challenge which led to right brain activity to innovate. Yes, I was challenged to report compatibility testing in a non-conventional way of an large consumer website. I used mind map and the test outcome were tremendous, check out on the Compatibility Test Report. Likewise, on June 17th 2015, I was asked to identify a FREE tool which could mirror Android and iOS devices over web to any geographical location (a similar tool like JoinMe, which is used over web). The challenge was to identify the tool in 60 minutes, check out how we accomplished the testing challenge. 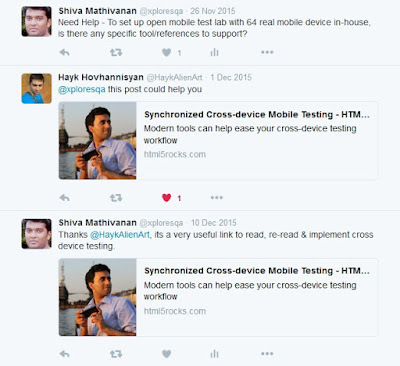 Click here: I embrace Mobizen and iTools for mobile testing. I now have a challenge to accomplish. I surfed for a while using search engines and with less hope, I customized a tweet to be able to fit into 140 characters and raised my query over Twitter. "Need Help - To set up open mobile test lab with 64 real mobile device in-house, is there any specific tool/references to support?. Fortunately, Mr. Hayk Hovhannisyan from @HaykAlientArt handle responded a html5rocks.com article which had a list of many useful tool that ease cross-device testing workflow in real time environment. I started using few tools and finally decided to implement Ghostlab. Because Ghostlab is very easy to install & configure provided you have a high bandwidth on WiFi network connectivity at your organization. My sincere thanks to Hayk Hovhannisyan for sharing his piece of knowledge. I deliberately wanted to implement the Ghostlab and then wanted to communicate to the testing world if the result is fruitful. Yes, we have successfully implemented in-house mobile device testing lab at our organization, Yay! Now a day’s most of the application are designed to be compatible with Mobile and Cross Browser (thanks to HTML5 – responsive design). In fact those sites which are not mobile compatible is hard to find a place in google search result. When it comes to QA testing the biggest time consuming job is to perform compatibility testing in multi-device and multi-browser. This is almost eating anywhere around 10 to 25% of overall testing effort. Currently we need to manually load the URL and perform the testing activity in each device and in each browser to make sure that the application is compatible with all the necessary devices and browsers. Keeping all the devices and browsers in sync with the URL we want to test. Remote Preview and many more. It is very easy to configure the Ghostlab Tool, Your Ghostlab installation file runs on the server and all mobile clients do not require any installations at all. It is very user friendly with very minimal lag time when comparing to other tools. It is available with competitive pricing. Using Ghostlab we can test any website on various browsers and mobile devices simultaneously. 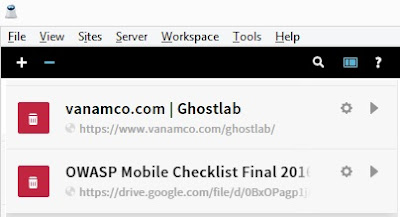 In order to perform cross-browser compatibility testing just drag the URL into Ghostlab and click the “Play” button or use the handy QR code to connect to a mobile device. (QR barcode reader app should be installed in mobile device). When we start to test in one of the connected browsers or devices. All other browsers and devices will mirror your actions. That’s clicking buttons, following links, scrolling the page, hovering your mouse over special elements like flyouts, filling out forms etc. 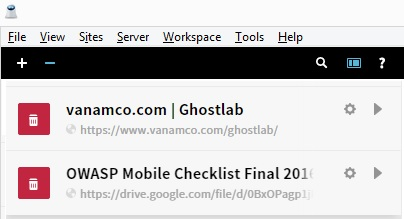 To download & install free 7-day trial version from VANAMCO, click on https://www.vanamco.com/ghostlab/ Or you can buy Ghostlab Licensed version and install in server machine. To have necessary web browsers (Chrome, FF, IE, Opera and Safari) to be installed in the server machine. To have all mobile devices fully charged and up and running. To have all mobile devices to set sleep mode to “Never” in iOS devices and in Android select any longer duration. To have all mobile devices Turn off the auto-lock. To have strong Wi-Fi network connectivity to support ample number of mobile devices and web browser access. To ensure Ghostlab server machine and all mobile device are connected to same Wi-Fi network using authenticated credential. Need to install QR barcode reader software in the mobile devices for loading the URL directly in the device browsers. Application Under Test (AUT) should be accessible from your system. If not able to launch your application from your machine, then raise a ticket with IT support team and get it resolved. (Probably you might need to add application IP address to your host file). All the real hand-held mobile device which are required to perform your mobile device testing should be in place under Wi-Fi network. How to Set up Ghostlab? Once you are prerequisite installations are ready, you need to follow the below procedures to install and configure your application using Ghostlab. Launch Ghostlab Tool from server machine. Click on the “Run” button, at the right corner, See Figure-2. Once the server starts to run the application URL, Click on Launch button, See Figure-3. Now the application will launch in default browser. 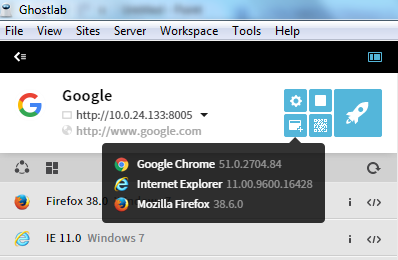 Click on respective browser from list of browsers displayed to launch specific browser, example FF or Chrome or IE versions, See Figure-4. 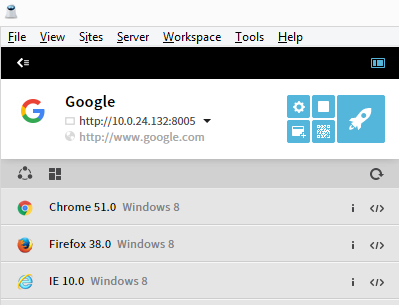 The list of browsers installed in Ghostlab server will be displayed below the launched URL. 4. How to Stop Ghostlab Server? 5. How to inspect Page Source HTML5 Elements? At respective browser, click on the tag on the right corner and inspect page elements as per requirements. See Figure-6. 6. How to Replace Launched Website URL? Now, click on stop and re-run to launch replaced website URL. See Figure-8. 7. How to Remove Launched Website? In order to execute Ghostlab web browser and mobile device browser synchronizing testing, you must need your requirements on version of browser and ios/android platforms in the first place to execute your cross browser testing. Ghostlab will not verify anything on its own. The responsive UI design issues should be addressed based on your customer and customer's customer requirements as well. We have to look for the most prominent mobile browser that your application would run on and the most prominent web browser version and operating system platform and then have them installed in the first place before executing your test cases. Hey All, It's been a long time that I have blogged here. I honestly apologize if you were curiously looking for articles to read from my blog and later realized that I did not post any new articles and otherwise as well ;) . I always wanted to write about testing, but something kept bragging me. Maybe, its because of my way of thinking style. Yes, I love to write/share about testing only if I learn something new, useful and interesting (at least to me) at work. Indeed I do read a lot from my testing mentors and other bloggers as well. So, with no more excuses I wanted to share an important testing lesson that I have learnt, yesterday. With no delay, let me share my challenging testing experience. What is the testing challenge? As a team we had a testing challenge. To identify a FREE tool in 60 minutes. The tool needs to mirror Android and iOS devices over web and can view from any geographical location. Everyone was asked to go back to our seat locations and the game started. All the team members initially thought it is really easy to identify the tool at the very first moment. Later during the course of identifying the app we found that it is taking more time & effort. Is this an easy challenge? No :( What's Next? Someone from our team started to phone a friend who works in Mobile team from another company to ask for help. Other guy bumped along sending emails to his testing communities in other states and countries to seek help. Another colleague, shouted hey you - Google my friend here I come :). She started to surf over internet to look for free tools. Yes, the time came to an end after a rigorous 60 minutes search to exhibit individual's test analysis report to the team. The outcome was really fascinating. Team projected several tool name which can mirror your Android devices to PC like MirrorOPSender, Chromecast app, Mirror Beta app, Mirroring360, Mobizen and other iOS tools such as Reflector, Airserver, X-Mirage, iDisplay, iTools etc. However, the drawback was most of the tool is not free and if its free it had its own limitations of installing and using it only for 7 days or the installation was not successful. Tools like Airplay works perfectly fine when all devices were connected on the same network over same WiFi. Not all tools but most of the tools dint work upto the testing challenge. Someone from the team shouted - Look here, I can view my mobile in my PC and I can control my device via PC too. Hurray! The end result of the research and analysis of identifying a tool which could support our need is really fruitful. Yes, Mobizen for Android and iTools for iOS is an easy to install tool. We should install the apps in the device and PC respectively to use it, That's All Folks! The purpose of this challenge is to help our clients view our mobile device screen onto his PC from any geographical location. In simple words If you had used Joinme and enjoyed the screen sharing from your PC then you would definitely feel it similar when you start using Mobizen for Android devices and iTools for iOS 8.1 and above devices - It's so easy to install and use. If we want to reproduce a bug from a mobile device and showcase it to a product owner who don't have an handy mobile device but can access a web url from PC, we can use these apps. If we want to showcase "User Acceptance Testing" of a particular functional module over web, which details how to do UAT from a user perspective, we can use these apps. If we found an intermittent defect and if the developer is really curious to know more about it, inform him and have him view it from his desk for quite some time and try reproducing. If we want to demo the latest build version of new feature implementations to your clients after QA-Sign Off, we can use these apps. P:S: There are lot of articles already available to demonstrate how to install and use the mirroring applications. Thus I have not provided any installation guide. I have suggested Mobizen for Android devices and iTools for iOS 8.1 and above devices which is very easy to install and also have provided the benefits of such mirroring applications. Please write to me for any queries. Thank you. This post is not about Independence day, It is more about Visual Studio Test Professional 2013 the tool I have been using for a long period on test case management and test automation. I would like to share the benefits that I see in this post. This tool provides end-to-end traceability to gain a complete view of the progress, quality of each requirement, tracking test case, tested product backlog items, test cases to business goals, conduct, record, repeat manual tests, manage test environments, communicate measurable requirements using acceptance tests, associated automation. It helps a lot for being Agile. Read more! The Visual Studio Test Professional actually sits on Visual Studio Team Foundation Server. Now I would like to talk about Visual Studio Team Foundation Server. The TFS, Team Foundation Server will manage your code with state of the art version control, links change to integrated work item tracking, Increases visibility of project with Team Web Access, centralize all roles in a single repository, collaborate in context to increase visibility, reduce hand-off waste, adopt agile techniques to become more effective, reconcile the agile team with your company's project management, continuously monitor the progress of the project, follow your requirements through their complete life cycle, seamlessly integrate test solutions, implement continuous integration to reduce risks in project. Read more! TFS automates and streamlines the software delivery process, as well as provides full traceability and real-time visibility into project status, for all team members, with powerful reporting tools and dashboards. Lab Management Delivering high-quality applications requires thorough testing of application code. It is important to understand about TFS when we learn about Visual Studio Test Professional which is a boon for testers, at least to me as a tester!. Now coming back to the topic we discussed already is about the Visual Studio Test Professional which offers a full suite of management tools, including Test Manager which has Testing Center and Lab Center. Testing Center helps us to create Test Plan, Test Suites, Test Cases in the Plan tab. Test tab helps to run, analyze, do exploratory testing, view exploratory test sessions and verify bugs. Track tab helps us to query, assign builds. Organize tab helps organizing the Test Plans, Manages Test Configurations, Test Cases and Shared Steps. Read more! f them. In both cases, you assign roles to each machine in the environment. For example, typical roles are Web Server and Desktop Client. The role names are used by your test workflow to determine what software and tests to deploy on each machine. Test Professional inserts a test agent on each computer, which enables the test controller to deploy software, run tests, and collect test results. Read more! Test Runner is something we use under Test tab from Testing Center which helps to run manual tests. If you are someone like me who execute the test case scenarios from Microsoft Excel document, you would be more interested to run it through Microsoft Test Professional's Test Runner. The test resolutions or comments can be provided during your test run and can be saved as test results. Can create bugs on the go by failing the test step. Read more! The most important feature that I like is performing Exploratory Testing using Microsoft Test manager, starting an exploratory test session, exploring the application, report bugs, makes re-testing easy. Read more! I'm done with my sharing of Visual Studio Test Professional 2013, if possible try at your end of how this tool fits your purpose. Please rely more on http://www.msdn.microsoft.com for more information on this tool. Thank you! This work is licensed under a Creative Commons Attribution-NonCommercial-NoDerivs 3.0 Unported License. Any views expressed here are my own, not those of my employer. Copying any content from this blog without my consent is not permitted. Please contact me first before anyone plans to reuse or republish any content listed in this blog. Content copyrights: Shiva Mathivanan. Theme images by Jason Morrow. Powered by Blogger.